No room in your house is more important than the kitchen, and that’s not just because that’s where the food is. The kitchen is the heart of your home! So, you probably want to add a little flair to this space where the whole family comes together. Some prefer the cooler, more modern, almost clinical feel of a minimalistic kitchen, but the warmer, richer designs are coming back, and a Spanish style is ideal for the kitchen. The beauty of it is that you can mix and match some of these elements to reach a style that is very much your own, but one that has that unmistakable Spanish soul. Ole! Archways are one of the key elements of this style, as it’s one of the things that gives it that inherent elegance and makes it instantly recognizable. You can incorporate an arch in the doorway, or you can create one in a semi-open plan kitchen, like in the example above. Actually, knocking out a kitchen wall to create an open-plan space is the ideal time to create an archway, because it enables you to widen the doorway as well, thus giving it a more authentic look. 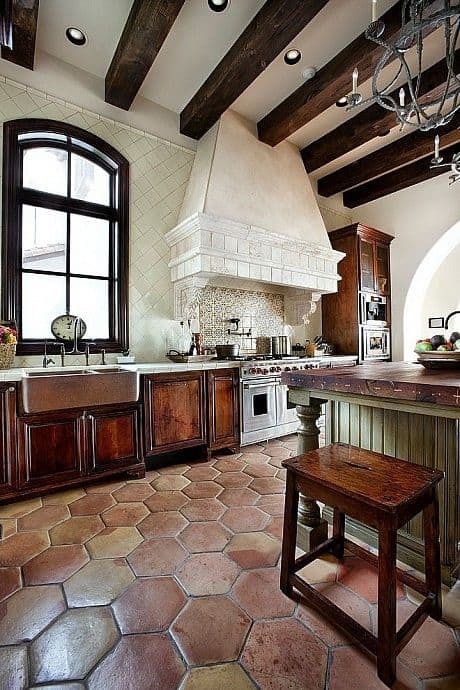 Another essential, this terracotta tile kitchen is the perfect example of the warmth and Spanish flair a choice like this can bring to your space. 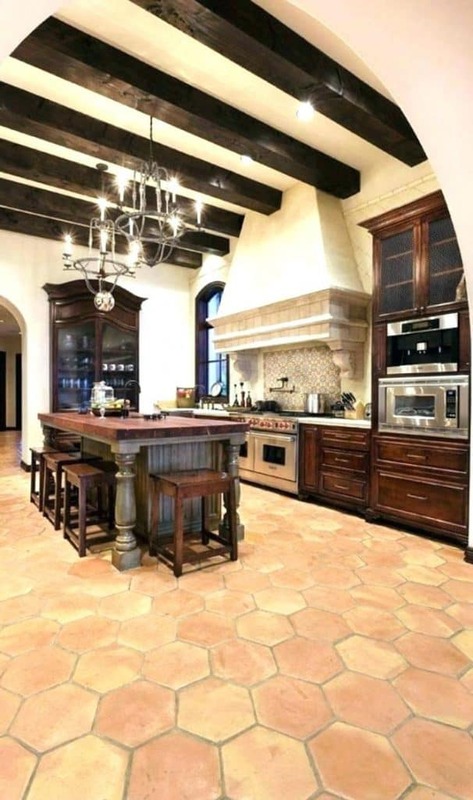 The kitchen we have here is a great example of the Spanish colonial style that you may be trying to achieve. That beautiful deep terracotta serves to ground the room and you can find the same sort of warm tones echoed in the choice of wood used for the cabinets, and even the tile used for the backsplash. 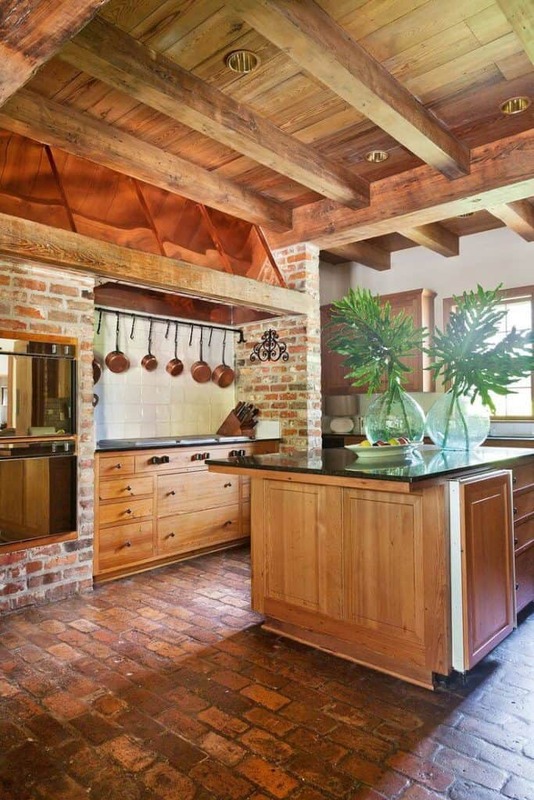 Typical of old time-y haciendas, the exposed wooden beams are a surefire way to give your kitchen a grandiose, and very Spanish feel. For a cohesive look, try to match the stain of the wood used for the beams when picking or painting your cabinets and worktops. That will be a nice, subtle detail that makes the design feel intentional. This kitchen is decorated with dark wood that beautifully contrasts the white tile and the light green of the island, but you can choose a lighter wood, as long as you match it. Kitchens decorated in a Spanish revival style will have these show-stopper cabinets. Far from serving a purely practical purpose, intricately decorated cabinets like this can even be featured as the visual focus of a space. Whether they’re vintage or especially carved for you, they make exquisite heirloom pieces that will stand the test of time and that anyone will be happy to incorporate into their own kitchen, even 50 years from now. The backsplash you pick can do a lot for a room, and it can be enough to add just a touch of Spanish style to an otherwise modern kitchen. In this example, the tile is not colorful, but it is very decorative. It fits right in with the monochrome kitchen, and echoes Spanish influences without needing to go all-out with a fully Spanish-themed space. Subtle details like this can add a lot of visual interest. 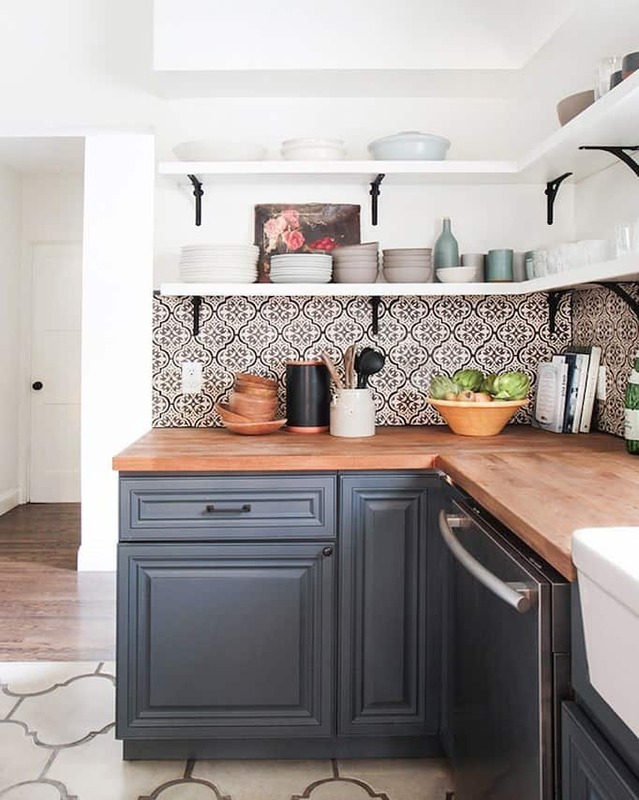 You can also pick a busier, or more colorful pattern for your backsplash, especially if you pick up some of the colors to repeat in the rest of your décor. The wrought iron chandelier is one of the mainstays of Spanish colonial style, and it’s featured in most of the designs, whether it’s a large space with tall ceilings, or a smaller, more intimate – even rustic – space. This kitchen features the iron chandeliers, but there are other elements you can incorporate, such as chairs, benches, shelving, decorative lattices, etc. You’d think that a kitchen that has stone walls would be cold and uninviting, but nothing could be further from the truth. 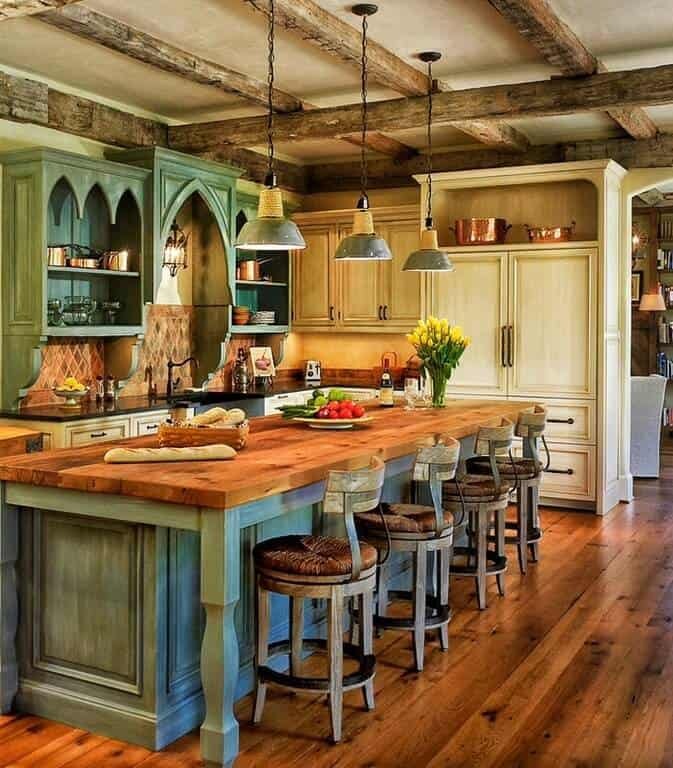 A stone kitchen can be incredibly interesting, and surprisingly cozy. 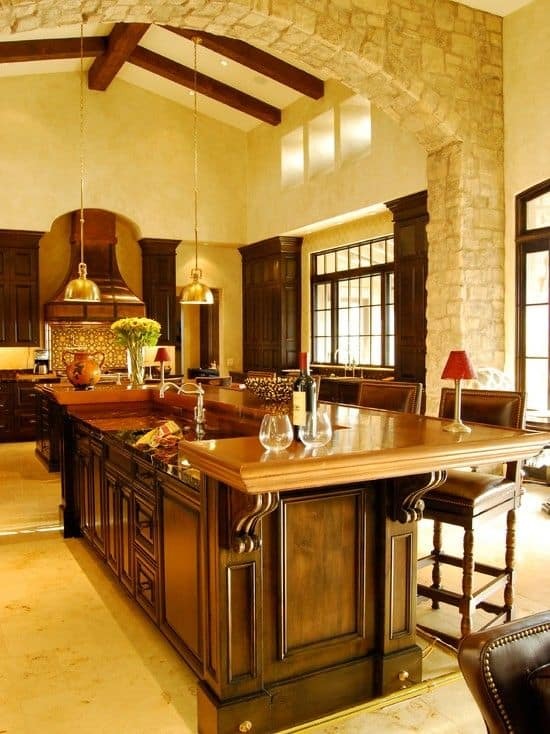 Kitchens like this usually incorporate a fireplace, so use that to your advantage and create a focal point there. Make sure to pick out colors that work harmoniously with the color of the stone used in your space. 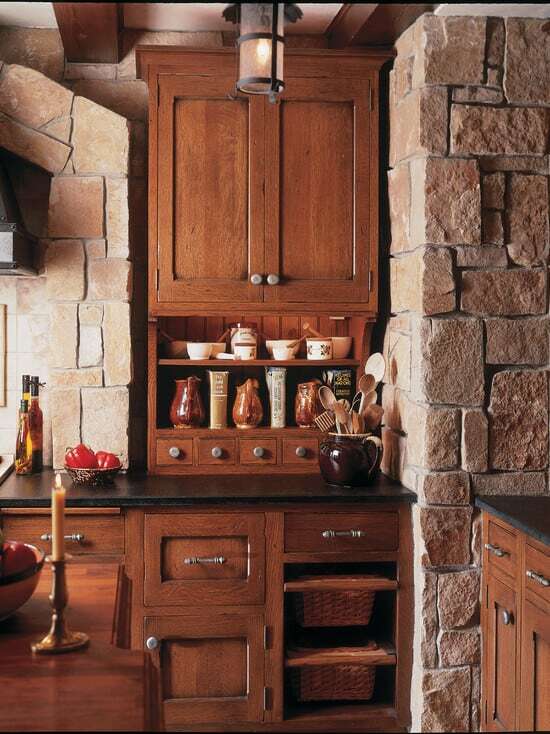 A stone kitchen will look very rustic, so natural materials and even natural fabrics work great in a space like this. Wood that is as natural as possible, wicker baskets, wooden spoons, etc. help complete the look. 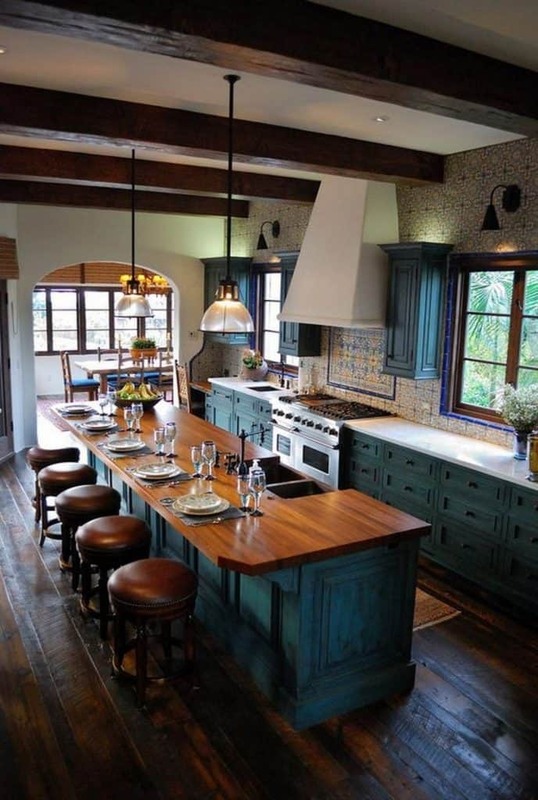 When borrowing from traditional Spanish colonial styles, you often encounter that distinct rustic, old, almost vintage patent – muted colors, chipped paint, a lot of natural materials and exposed wood. Just a look that says that this space is well used and well loved and has stood the test of time. You can “fake” this look, of course, with some strategic roughing up of some corners and chipping the paint. You also want to be careful to choose slightly mismatched colors – this gorgeous example makes use of off-whites, very muted greens, and exposed wood to leave that impression of timelessness. In direct contrast with the dark wood that is typical for the Spanish style, there is also an option for all-white. This is exceptional especially if you live in a very sunny place, as this is going to ensure that you have a very bright space. You can combine it with natural wood or other colors that work harmoniously with this palette, whether we’re talking about an island, stools, like in this example, or a backsplash. White also makes any space look larger, because it reflects light. 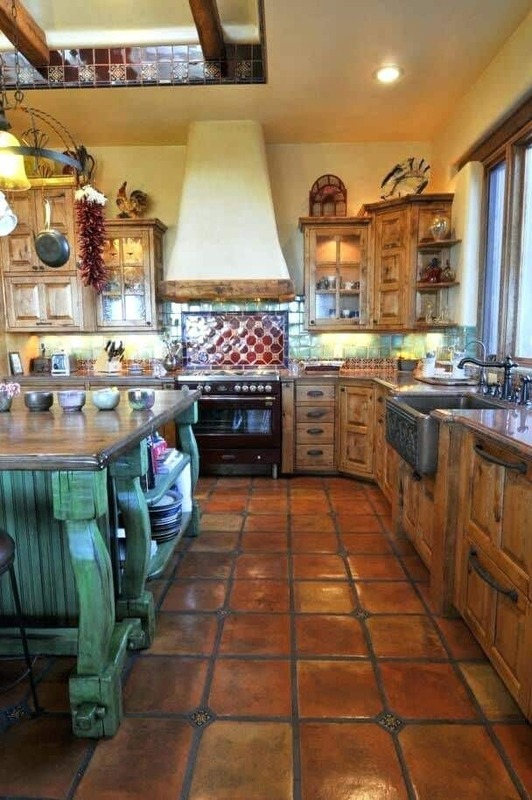 A wonderful way to achieve a Mediterranean style in your kitchen is to inject some color into your space. 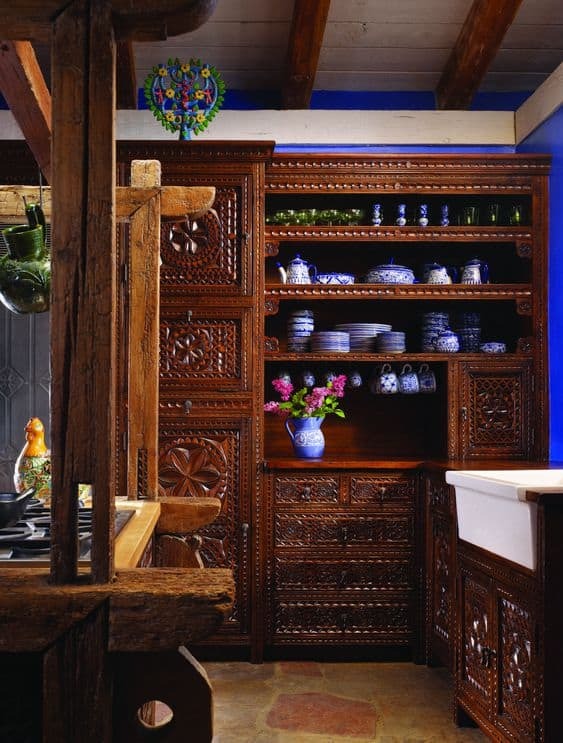 While yes, natural wood is a big staple, kitchens in this style are often colorful! Mid-blues, faded greens, off-whites, and even shades of yellow can be used for an authentic Spanish kitchen. You can choose to paint your cabinets, or you can leave those natural and paint your walls, instead. This example shows you how fun it can be to embrace color, especially if you pair it with a colorful backsplash that echoes the same colors you have in your kitchen. 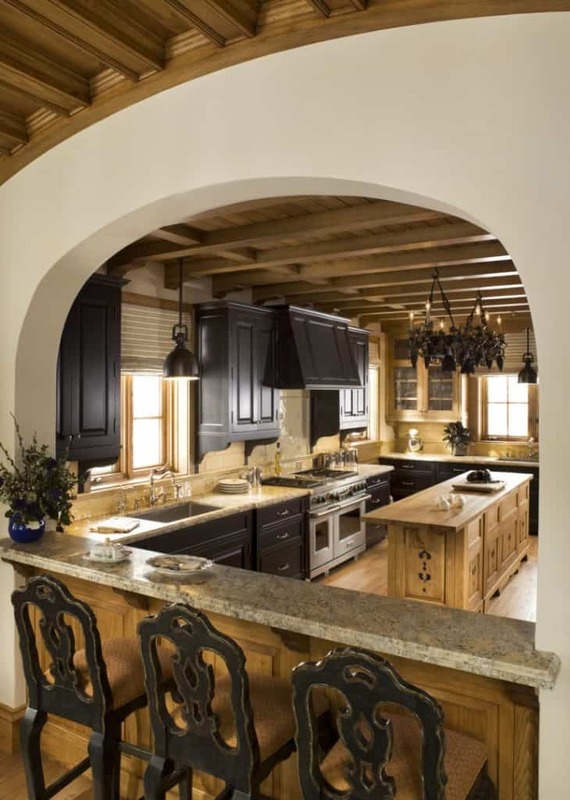 You may think that dark-stained wooden furniture looks heavy and outdated, but it’s essential for the Spanish colonial look you’re going for. 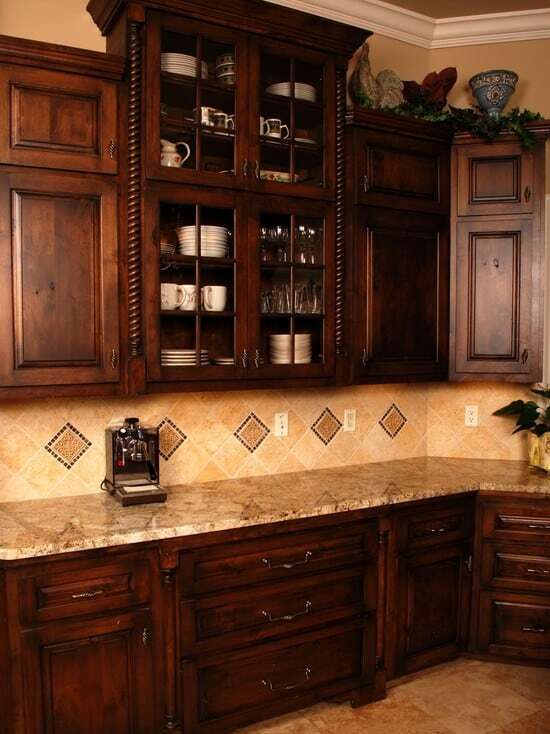 In this image, you can see how dark cabinets can look expensive and traditional. Especially if you have those decorative design elements we talked about earlier, like carvings and other intricate designs. That will keep the pieces from looking too dark and monotone, and instead will enhance them and turn them into your most valued pieces. It’s very easy for a space with very high ceilings to appear cold and impersonal, but they are ideal for Spanish style kitchens. The extra space gives it that hacienda look that is so sought after. If the house doesn’t have wooden support beams, you might consider adding them for the visual effect alone. Otherwise, the height also allows you to incorporate wrought iron chandeliers that are a staple for this style, or pendant lights that can introduce a more modern element to the space. This is a stunning example of how brick can bring a lot of warmth and how perfectly it fits in a space like the kitchen. Here, it’s paired with terracotta floor tiles and copper accents throughout the space, but you can mix in your own style. Keeping the warm color palette definitely gives it that authentic touch you are after, but adding some color can also work beautifully. You can check out the previous points about color for more tips on mixing and matching different tones for an authentic-looking result. It turns out that treating a space that feels authentically Spanish is easier than you thought! There are a lot of elements to this style that you can borrow in order to incorporate into your own space, and a lot of different adjacent styles to explore. Whether it’s a Mediterranean kitchen, a colonial one, a traditional one, or a modern one, you can make your own Spanish-inspired kitchen. You just need to know how to successfully merge the elements you like to create a cohesive, beautiful look.